Only a couple months have gone by since the 43rd Annual Meeting in Rancho Palos Verdes, California and I am already getting excited for the upcoming 2019 Annual Meeting in Banff, Alberta, Canada. As a valued member of the Academy, I encourage you to register now for the 44th Annual Meeting and reserve your hotel room before registration opens to non-members on November 5. 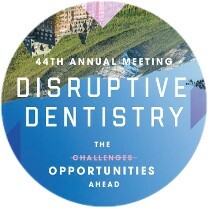 The 2019 Annual Meeting takes place August 8-10 and our theme is “Disruptive Dentistry: The Challenges Opportunities Ahead,” focusing on the immense possibilities revealed by new technologies and techniques introduced every day in the world of esthetic dentistry. The 2019 Annual Meeting will take place at the Fairmont Hotel in Banff Springs. You can read about hotel and transportation information on our website. You’ll need to register yourself first in order to receive the link to secure your housing for the conference. Again, non-member registration opens November 5 and the housing block will begin to fill quickly after that. Associate members, if you are looking to elevate your membership status to Fellow, one of the prerequisites is to speak at one of our scientific sessions. To fulfill this requirement please complete the online speaker application, which will be provided to future annual meeting program chairs for consideration. Additionally, if you know of someone who would like to apply for Associate Membership during the next cycle, the deadline for applications is March 1. Applications must include a resume, photo and three sponsor letters. If you have any questions, please refer to this overview for details, or reach out directly to our executive director, Joe Jackson. I am looking forward to connecting with all of you in Banff Springs and I thank you for the privilege of allowing me to serve as your President. Please don't hesitate to reach out directly (execudent@msn.com) with questions or ideas on how I can best serve you and our profession throughout the coming year.